Whether you’re shopping in a neighborhood liquor store or relaxing at a local bar, the library of beers a person can choose to consume is extensive and, quite frankly, overwhelming. How do you decide which one to pick? How does the brewery get your attention? The answer may simply be in its aesthetic, and to that end we’re sharing our favorite picks of craft beer designs for today’s celebration of International Beer Day. The millennial generation is saturated with people looking to express their individuality and support local brands, a trend that has elevated the craft beer movement from a passing trend to a cemented expectation. 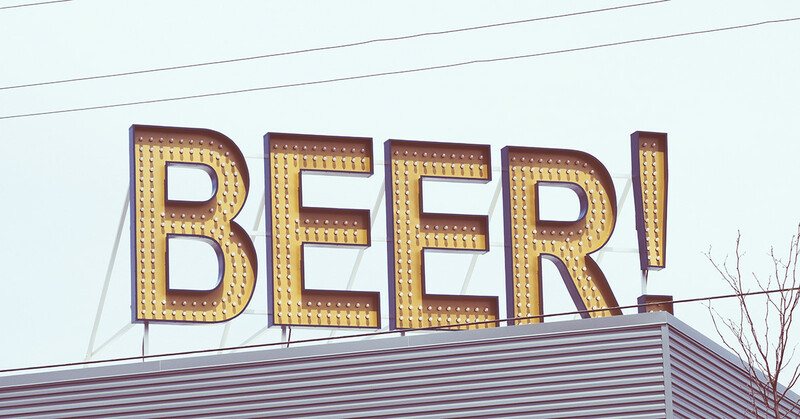 Independently owned, craft breweries concoct less than 6 million gallons of beer each year. Unlike a micro brewery, a craft brewery has strict limitations on how its beer is produced. Craft beer is generally made with traditional ingredients combined with a splash of nontraditional components to diversify its flavor. With more than 10,000 craft breweries worldwide, the current industry is an attractive market for brewers to enter — and that means a lot of competition. Breweries stand out by showcasing their creativity with outlandish beer names, unique flavor profiles, and eye-catching designs — all to persuade the consumer to order one or another libation at the bar or put it in the shopping cart. Customizations range from bar handles featuring whimsical animals and nightmarish monsters to bottles with vibrant colors or unusual shapes. Here are a few breweries that intrigued us with their design and kept us hooked with their taste. Rogue Ales, based in Portland, Oregon, truly captures the consumer’s attention through its imaginative design. Its Voodoo Doughnut Ale bottle features an energetic pink skin to reflect the drink’s sweet, candy-like taste. On the less-than-lively side is their Dead Guy Ale beer tap handle, donning a decrepit skeleton for those seeking a darker, malty pour. This Vermont-based brewery never hesitates to go wild with bottle labels, and its grapefruit India Pale Ale (IPA) — appropriately named Electric Peel — is no exception. With an illustration of an electric plug biting into a grapefruit, accompanied by visual displays of hops, this label perfectly captures the “tantalizing tingle” the beverage offers its patrons. 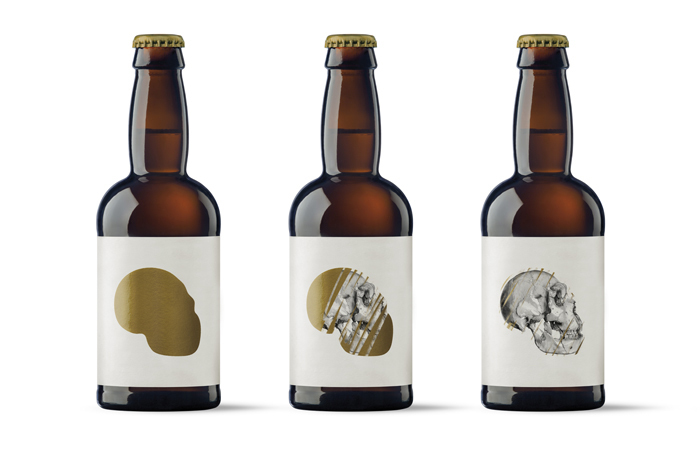 A craft beer originating in Spain, Dolina features an interactive bottle label for consumers to enjoy. Inspired by archaeological deposits, the label welcomes the drinker to scratch off its gold foil to reveal a full image of a skull. 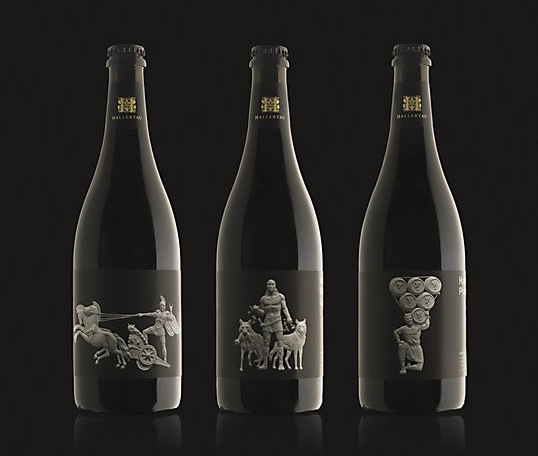 With depictions of Roman sculptures in black and white, Hallertau’s Heroic Range bottle designs are filled to the brim with beauty and humor. Brewed in New Zealand, the Porter Noir label features a man holding multiple barrels of wine with a keen smile, emphasizing its aromatic inspiration from wine and cherries.